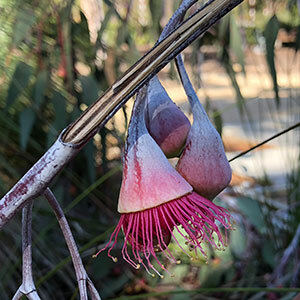 With brilliant red or pink flowers and attractive peeling bark, Eucalyptus caesia is best known for the cultivar “Silver Princess”. Regarded as one of the best garden eucalyptus it is widely used in landscaping. Best described as a small weeping tree, the foliage is a deep green with a pronounced silvery bloom to it. Two sub species are identified with Eucalyptus caesia subsp. caesia being the smaller growing or dwarf eucalyptus variety. The bark is ‘minniritchi’, with older red long outward curling strips that reveal paler green bark beneath. The flowers form from winter through to spring and hang down beneath the stems. The flowers are followed by large gum nuts which can also take on a silvery appearance. This is a tree that will take a few years to develop the weeping habit that it is well known for. The gum nuts contain seeds which are a favoured method of propagation. Originally from Western Australia, this is a species that requires a dry summer to perform at its best. Once established this is a very easy care plant although it will require pruning over time. The root system is fairly shallow so we suggest a position where the tree is protected from strong winds. Plant in a well drained soil in a sunny position to very light shade. Prepare the soil well by digging in aged compost and some cow manure. Water through long dry periods over the first few summers. As this is a species that forms a lignotuber, Eucalyptus caesia can be pruned back to ground level to rejuvenate the whole tree. Over time the weight of the branches and the gum nuts can cause them to break. Many gardeners remove the gum nuts to prevent this. Common Name – Silver Princess, Gungurru. Soil – Well drained with some moisture, sandy loam to light clay. Flowers – Red or Pink. Flowering time – Winter to Autumn.